Until another car comes along, until another driver with camera comes out, one can almost indulge in Twilight Zone-like fantasies as one stands along this portion of old U.S. 66. 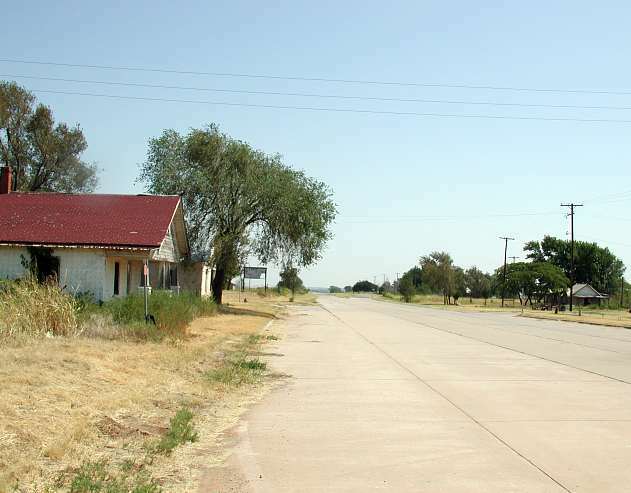 In Texola, Oklahoma, the highway loses its divided nature through what's left of the town. Here, as I communed with the pavement in intense September heat, I had my other-worldly feeling suddenly heightened by two huge military jets, swooping low over the highway and almost directly overhead. From virtual silence to "attack" and back to virtual silence -- It only took some few seconds.